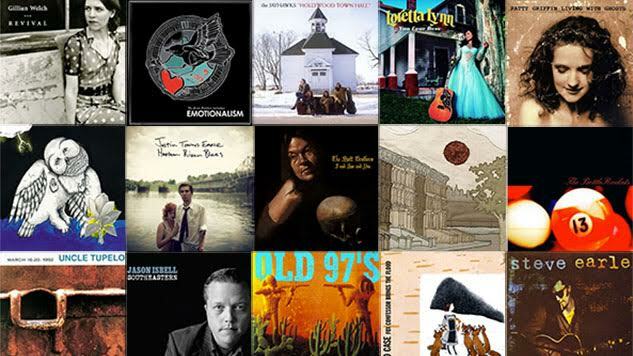 Alt-country is such a hard genre to define that the wonderful music magazine devoted to it proclaimed itself the “alternative-country (whatever that is) bi-monthly.” For our best alt-country albums list, we’ve chosen to focus on albums with significant country elements operating outside of the mainstream country music industry. So country stars we love like Kacey Musgraves and Chris Stapleton didn’t make the cut. Neither did folky Americana acts like Josh Ritter, The Civil Wars or First Aid Kit, though we’re huge fans of all three. The alt-country movement had plenty of pre-cursors in the folk-rock of Gram Parsons and the renegade country of Merle Haggard and Willie Nelson. But 1985 was really a watershed moment for the genre with Green on Red, Jason & The Scorchers and Mekons all exploring traditional country through the lens of punk rock. The ’90s kicked off with the first album from Uncle Tupelo, No Depression, which became synonymous with “alt-country” thanks to the magazine of the same name. The following 50 albums span 30 years of alt-country and stretch the limits of “whatever that is.” We easily could have picked 100, and we’d love to hear your favorites that we missed. We’ve limited our selections to two per band, otherwise the entire Uncle Tupelo catalog would be here. The Jayhawks returned as backing band for Joe Henry’s Kindness of the World in 1992, just as the band was hitting its own stride. Together, the two acts perfected what they’d begun the year before on Short Man’s Room. The banjos, mandolins, violins, pianos, pedal steel, occasional harmonies and prevalent jangly guitars provided a rich, engaging aural landscape for Henry’s earnest voice and poetic wresting with the human condition. Kindness evidenced Henry as one of the most skillful and honest lyricists in popular music. His next release, Trampoline, commenced a string of sonic experiments that—combined with lyrical prowess that has only grown—have established him as one of most interesting and vital singer-songwriters working today. Though he would refuse to be constrained by the genre, Henry’s collaboration with the Jayhawks serves as an exemplar of the then-nascent genre.